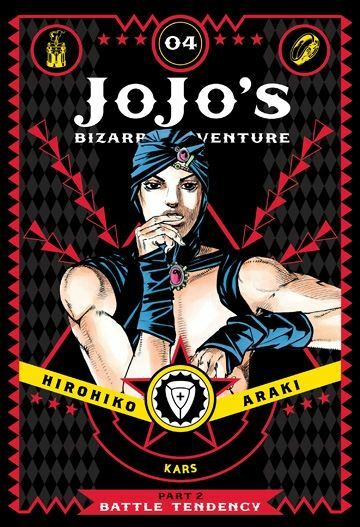 VIZ Media is publishing the legendary Shonen Jump manga, JoJo's Bizarre Adventure, in English for the first time. The series is being repackaged in deluxe edition, hardcover, graphic novels with color pages and new cover art. Created by Hirohiko Araki, JoJo's Bizarre Adventure is a multi-generational tale that centers on the heroic Joestar family and their never-ending battle against evil. JoJo's Bizarre Adventure begins with the “Phantom Blood” arc and continues in the “ Battle Tendency” story arc, which is set in 1938. As JoJo's Bizarre Adventure: Part 2 – Battle Tendency, Vol. 4 (Chapters 50 to 99) opens, our hero Joseph “JoJo” Joestar and Master Lisa Lisa face two of the Pillar Men, Lord Kars and Wamuu. JoJo will face Wamuu, and Lisa Lisa will battle Kars. The prize is the “Red Stone of Aja.” By the end of the battle, a secret will be revealed and an ultimate being will be born. THE LOWDOWN: The JoJo's Bizarre Adventure manga is like nothing that I have ever read before it. However, this mixture of period action-adventure, horror, and occult-history is for anyone who has enjoyed everything from the Indiana Jones movies to The Mummy films with actor Brendan Fraser. JoJo's Bizarre Adventure: Part 2 – Battle Tendency Volume 4 is the final volume of the Battle Tendency arc. It is a fun read with a happier ending than the first arc, Phantom Blood. Many of the elements, most of the turns-of-event, and just about every character are ridiculous, but JoJo's Bizarre Adventure works. It is pure escapism, a kind of pulp fiction born as a wild and woolly shonen manga. I'm ready for the next arc. POSSIBLE AUDIENCE: Fans of weird shonen manga will want to try the Shonen Jump Advanced series, JoJo's Bizarre Adventure: Part 2 – Battle Tendency. VIZ Media Announces "Jojo's Bizarre Adventure - Battle in Egypt" DVD"
VIZ MEDIA Announces "Jojo's Bizarre Adventure Real Escape Game"
VIZ Media Announces "Jojo's Bizarre Adventures: Stardust Crusaders"